A politically charged painting of Nativity scene known as the "Banksy Christmas card" is making its rounds on the Internet again this week. The image features what appears to be the New Testament's Joseph and Mary blocked from reaching Bethlehem (the Palestinian city purported to be the site of Jesus' birth) by the Israeli West Bank barrier. People run past the separation wall during the West Bank's first marathon in Bethlehem, April 21, 2013. The "Christmas card" has been around since at least 2005 -- according to the Irish Independent, British pop star Robbie Williams is believed to have bought the painting that year after seeing it in a gallery -- but it appears to enjoy something of a viral resurgence every December. On the photo sharing site Imgur, for instance, the image garnered more than 180,000 views within nine hours of being posted Wednesday. "Love [Banksy's] work," wrote one Imgur user. "The power of the messages in some of his pieces [is] highly thought provoking." A work by Banksy is seen on a wall in the West Bank town of Bethlehem, Dec. 21, 2007. 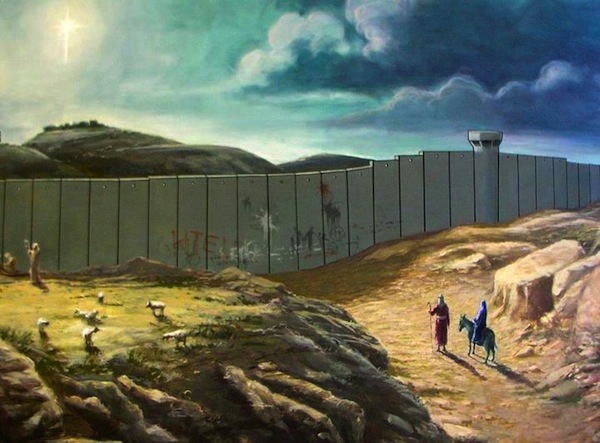 Banksy has on a number of occasions expressed his political views regarding the Israeli-Palestinian conflict through his best photo christmas cards. In 2005, for instance, the mysterious artist traveled to Palestine, where he painted nine images on the West Bank wall. In 2007, he visited Bethlehem to add more art to the wall. Those works included a graffitied image of a dove wearing a bullet-proof vest, according to CNN.